Federal and Quebec officials will meet in two weeks to hammer out an immigration plan for the province that Premier François Legault says must include cuts to the number of newcomers and compensation for the costs of asylum seekers. The immigration talks come as Quebec finds itself dealing with labour shortages. 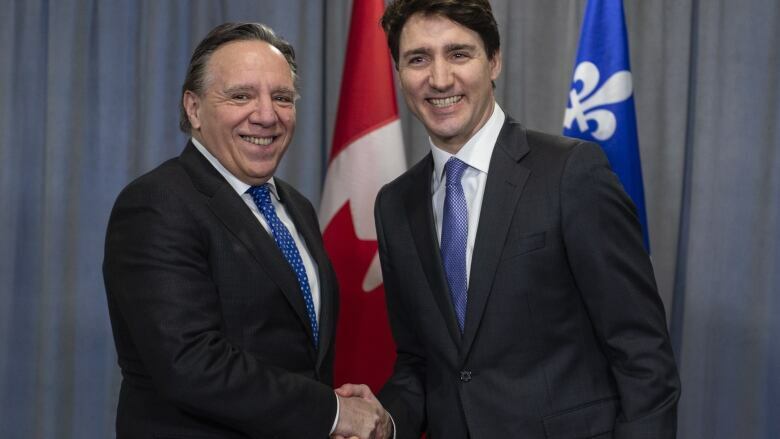 Legault met with Prime Minister Justin Trudeau on the sidelines of a Liberal cabinet retreat in Sherbrooke, Que., today, and Legault laid out his list of demands for the federal government. They include more federal cash to pay for the processing, shelter and social service costs associated with thousands of asylum seekers who have crossed into the province from the U.S.
Legault said he will not back any political party in the next federal election, but he's looking for pledges to reimburse the $300 million the province has incurred for asylum seekers. "We would like to have commitments from the different federal parties for these amounts," he said. So far, the federal government has provided $140 million to Quebec. Legault ran on a campaign promise to slash immigration levels by 20 per cent in his province. Last month, his Coalition Avenir Québec government tabled details of its policy, confirming it will proceed with a plan to reduce the number of immigrants to 40,000 in 2019, down from more than 50,000 last year. But it requires co-operation from the federal government to follow through, since Quebec only has jurisdiction over economic immigration. The federal government oversees family reunification, refugee and other programs. But Intergovernmental Affairs Minister Dominic LeBlanc warned that at a time of a severe labour shortage in Quebec, keeping the provincial and national economy strong must be a key consideration in broader talks about reducing immigration levels. Quebec's economy is performing well, and some businesses in the region have been forced to refuse contracts and turn down sales because they don't have enough employees to do the work, he said. "So you can imagine the multiplier effect of that over time on the economic growth in Quebec, which frankly is something that's very important for the whole country," LeBlanc said. "We don't want to, because of the acute labour shortages, in any way contribute to something that would slow the economic growth of this province, which is a shared priority obviously between the two governments." The joint federal-provincial meeting will take place in two weeks in Gatineau, Que.